For World TB Day 2011 we enter the second year of a two-year campaign, On the move against tuberculosis whose goal is to inspire innovation in TB research and care. This year's campaign challenges us to look at the fight against TB in an entirely new way: that every step we take should be a step towards TB elimination. 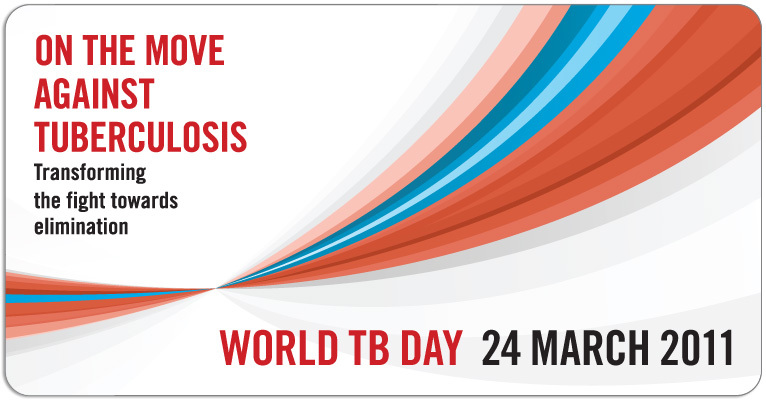 The campaign is inspired by the ambitious new objectives and targets of the Global Plan to Stop TB 2011-2015: Transforming the Fight-Towards Elimination of Tuberculosis, which was launched by the Stop TB Partnership in October 2010. This new plan, for the first time, identifies all the research gaps that need to be filled to bring rapid TB tests, faster treatment regimens and a fully effective vaccine to market. It also shows public health programmes how to drive universal access to TB care, including how to modernize diagnostic laboratories and adopt revolutionary TB tests that have recently become available. The campaign will focus once again on individuals around the world who have found new ways to stop TB and can serve as an inspiration to others. The idea is to recognize people who have introduced a variety of innovations in a variety of settings.